Knee pain is one of the most common conditions found in adults, and it is often caused by the natural deterioration of the knee joint due to overuse. The knee is arguably one of the most used joints in the body. This joint is responsible for hold the weight of almost the entire body, and during running or exercise, it can endure impacts up to three times the body’s weight. 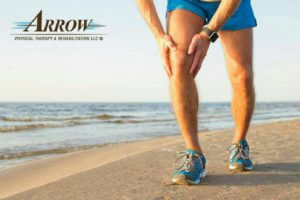 Because of this, wear and tear to the knee is common and can result in chronic knee pain. While chronic knee pain may require you to see a physical therapist for treatment, there are some lifestyle changes you can make that may help reduce your pain or at least slow the damage in your knee. One of these lifestyle changes is buying proper shoes to reduce knee pain. What type of shoes can help reduce your knee pain? Cushion – Cushion is one of the most important elements a shoe can have because it helps reduce the impact and pressure on the knee. When you constantly wear shoes that are not padded, your knee joint becomes jolted between the hard pavement and the weight of your body. The padding in your shoes helps to absorb the impact of your body weight with every step, and saves your knee joint from becoming damaged or inflamed. Insole support — Shoes with proper insole support can help prevent your step from leaning too far inward or outward, both of which can cause the knee joint to grind and wear down. Over time, this can lead to inflammation in the knee joint and chronic knee pain. If you are not able to find shoes that fit these two requirements just right, you can add inserts into your shoes to added cushion and insole support. If you’ve been suffering from chronic knee pain, it’s time to find treatment so you can return to the activities and lifestyle you enjoy. Our team at Arrow Physical Therapy in Edison, Woodbridge and Union, New Jersey offers personalized treatment plans to help you find relief from your chronic knee pain. We have won years of awards for our outstanding patient service and treatment. Contact us today to schedule your appointment.